As we come into the summer season, most of us transfer our plants outdoors from the greenhouse. Even as warmer days appear in the spring, the temperature inside the greenhouse can become too high, killing off tender seedlings. The same can happen if you move your plants into the greenhouse in the fall. Install an exhaust fan with intake shutters and a thermostat. This will give your plants the much needed air circulation that they require. You must have electricity to operate a fan system, so keep that in mind when planning your greenhouse purchase. 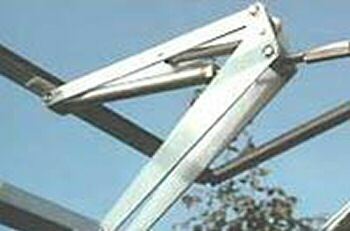 Be sure to have solar powered roof vents in your greenhouse -- whether they be roof vents or side vents. How do solar powered vents work? This type of vent has a cylinder tube filled with a liquid that reacts to temperature. This means that when the greenhouse inside temperature reaches about 62 to 65 degrees F, the vents will automatically start to open. As the temperatures drop during the evening, the vents will also close. 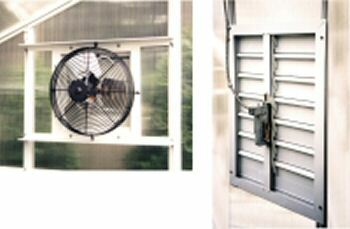 These vents can also be operated manually if you wish and can easily be disabled for colder winter months. It is best to have a screen door for added air circulation. Install a rotating fan to keep air moving. Use a misting kit. The misting kit can attach to an existing faucet or garden hose. Tiny droplets are emitted from each misting nozzle and can lower air temperature by up to 20 degrees F.
Hose down the interior of the greenhouse with your garden hose. This will help to cool it down. Shade cloth can be used either on the interior of the greenhouse or on the exterior. When placing cloth on the exterior -- always place on the side of the roof that receives the hottest sun throughout the day. Be sure that the shade cloth is not laying directly on to the roof, as mildew will form if there is not adequate circulation fo air. It is best to attach the shade cloth to 2" x 2" wood pieces to keep the shade cloth off the greenhouse roof. Remember that electricity and water are not a good mix and always be careful.